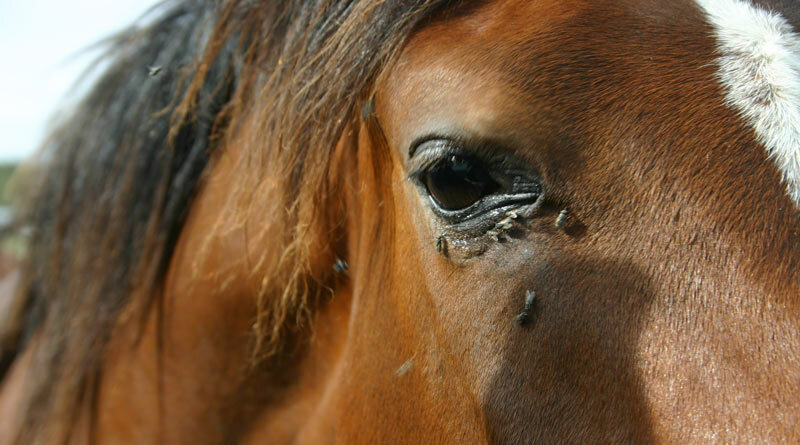 As well as being annoying, flies may also carry other parasites that can infect the horse such as Habronema spp. and Onchocerca cervicalis, which can affect the skin and in extreme cases the eye. As summer looms in the Northern Hemisphere, it’s a good time for horse owners to start thinking about controlling flies. Horses are prone to attack from many species of parasites including house flies, horse flies, black flies, blow flies, bot flies, mosquitoes, midges, lice, ticks and mites. They can cause dermatitis, pruritic (itchy) conditions, lumps and skin lesions. They can also cause conjunctivitis, headshaking and contamination of wounds plus have the potential to spread other diseases too. Zoetis veterinarian Wendy Talbot said flies are one of the down sides of warmer weather, “but if you act early to reduce the numbers breeding in your horse’s environment you can help stop them bothering your horse throughout the entire season”. Biting midges, Culicoides spp. are a particular pest as they can cause sweet itch. Mosquitoes are also well-known airborne irritations. There are many recorded species, including those with the potential to spread diseases such as the fatal West Nile Virus. Flies may also carry other parasites that can infect the horse such as Habronema spp. and Onchocerca cervicalis, which can affect the skin and in extreme cases the eye. Most flies thrive and breed in warm, moist conditions such as on dung, rotting bedding or spilt feed material. From these unsavoury places they can spread bacteria to the horse, especially to vulnerable areas such as the eye and wounds. “The best way to control the nuisance of flies is with good environmental management to control their breeding grounds and a proven fly repellent or insecticide,” Talbot said. Use a spray insecticide on your horse’s coat and a specifically designed cream product on sensitive areas such as ears and sheath. Try a specifically designed insecticide for areas around the horse’s stable where flies congregate, such as the roof or on mesh around the windows. Always check the product label carefully to ensure it is safe to use in a horse’s environment. Clear horse droppings away from the stable and pasture each day so that flies can’t breed in them. Muck heaps should be kept away from where your horse sleeps and grazes. Stables should be scrupulously clean at all times. A clean, well-groomed horse will generally attract fewer flies. Make sure there are no puddles near the stables. Invest in a fly rug and/or a fly facemask for your horse if it is badly affected. Spraying fly rugs with insecticide or repellent will provide extra protection. Stable your horse in mornings and evenings when most flies are about. Only use an insecticide or repellent that’s designed for use on horses. More information on fly control can be found here.